Joe Minor, Hyannis, Nebraska, longtime Krebs Ranch bull buyer purchased several 18 month old bulls. 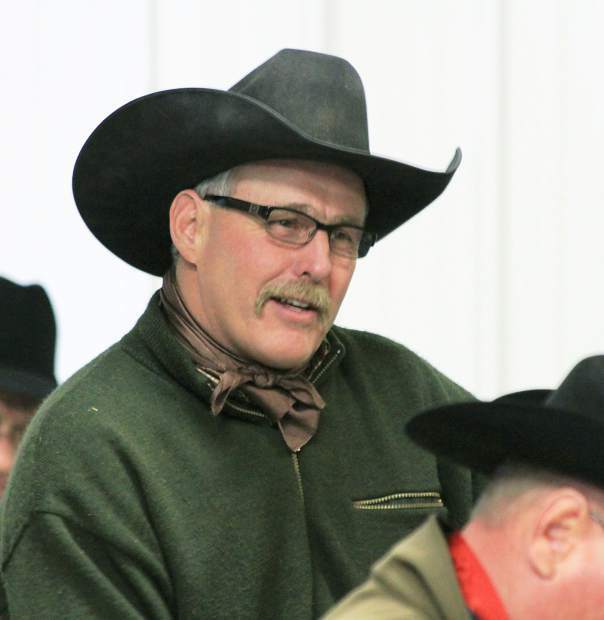 John Tyner, Sartell, Minnesota was on hand again for the Krebs Ranch bull sale. 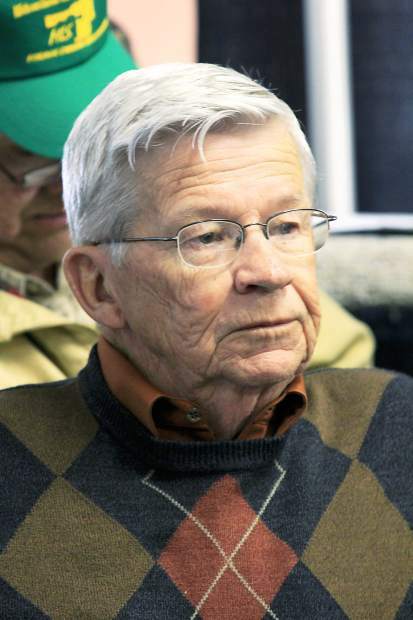 The Krebs Family held a very successful 36th Annual Production sale at the ranch on Feb. 19. This is a sale where you can find excellent bulls all day long. The bulls are sold in catalog order starting with the Fall yearlings then going on to the reserve champion Pen of 3 bulls at this year's National Western Stock Show in Denver and on to the highly talked about Denver Carload bulls. Since 1980 Krebs Ranch has shown over 50 Champions and Reserve Champions in the Pen and Carload shows in Denver. Those bulls have definitely left an extremely solid cowherd for Krebs Ranch and have had a major influence on the Angus breed as a whole. But most importantly, those bulls have put money in the pockets of their customers in the way of heavier weaning weights and increased carcass quality. Topping the sale was lot 1, KR Cash 4948, a Sept. 2014 son of Barstow Cash with EPDs of CED 10, BW 0.8, WW 64, YW 123, Milk 22. This bull had an actual birth weight of 84 pounds, 205 weight of 777 and 365-day weight of 1,399 pounds Pleasant Valley Angus, Brookville, Maryland, and Grand River Angus Farm, Grand Rapids, Michigan, teamed up to buy the bull at $50,000. Selling at $37,000 to Calla Cattle Co. Milaca, Minnesota, was lot 58, KR Black Granite 5386, a Feb. 2015 son of Connealy Black Granite with EPDs of CED 5 BW 2.1 WW 65 YW 110 Milk 29. Lot 38, KR Little Joe 5497, a Feb. 2015 son of KR Little Joe, that was member of the Denver Carload has EPDs of CED 11 BW -1.4 WW 77 YW 131 Milk 26 sold to Alta Genetics, Balzac, Alberta, Canada, for $22,000. Lot 42, KR Black Jack 5018, a Jan. 2015 son of CFCC Black Jack 001 with EPDs of CED 7 BW 3.1 WW 54 YW 91 Milk 29 sold to Malsom Angus, Parma, Idaho, for $20,000. Also selling at $20,000 was the leadoff bull of Krebs Ranch Pen of 3. Lot 25, KR Cash 5212, is a Feb. 2015 son of Barstow Cash with EPDs of CED 11 BW .3 WW 68 YW 133 Milk 20. Kessler Angus, Milton-Freewater, Oregon, was the buyer. Lot 30, KR Joe Canada 5062, a Jan. 2015 son of K Bar D Joe Canada with EPDs of CED 9 BW 0 WW 50 YW 93 Milk 26 sold to Bartos Angus and Frederick Angus, Verdigree, Nebraska, for $19,500. Lot 34, a Denver Carload bull sold to Alta Genetics for $18,000. KR Cash Only, is a Feb. 2015 son of Barstow Cash with EPDs of CED 3 BW 2.6 WW 80 YW 146 Milk 19. This was an excellent sale for Krebs Ranch, but don't let these top bulls listed and the average scare you for next year. There were many bulls throughout the day selling in price ranges that will fit most commercial cattlemen.